We have a colour challenge for you at Just Add Ink this week. We would love for you to join us. Head over to Just Add Ink and check out the gorgeous inspiration from the Design Team. Gorgeous. Love the way you did the background and the pretty flowers. Stunning as always. Love the colour combo. Well done. Gorgeous. What do you mean by finger walk? Your work is stunning. Just started following your blog a few months ago and love your vintage style. I don’t believe for one second that these colors scared you! Especially since this card is gorgeous! I love how vibrant the flowers look against that fabulous background! 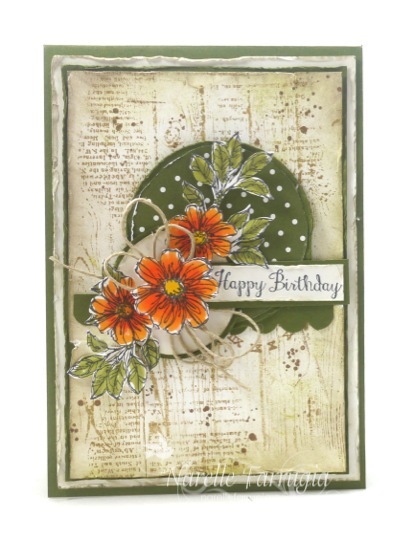 Wow, ♥love♥ your card Narelle – it’s gorgeous! I love those colours together too. Wow!! Those flowers are so vibrant and really pop off the page. Wow this is so stunningly beautiful! Love that background with it’s grungy inkiness! Couldn’t pass by this masterpiece (on my way to your card for FMS) without saying WOW! Absolutely adore this card Narelle! The background is spectacular and your flowers so vibrant – love it! You certainly did an amazing job with these colours, this looks effortless!! And I must ask, what is ‘finger walking’?? I’m very intrigued…..
Wow! Absolutely beautiful. Love the colours and how the flowers really pop. Another amazing shabby card, Narelle. You are such an inspiration. Very pretty! Love vintage cards.